stone pillar vineyard | KC Homes... Great homes, cool places, fabulous shops... all in KC! KC Homes… Great homes, cool places, fabulous shops… all in KC! Happy Friday! Today is winery day and we are going to take a look at Stone Pillar Vineyard. It is right here in Olathe at 11000 S. Woodland Road. 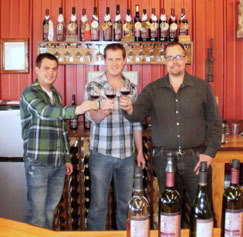 Stone Pillar is a family owned and run business that offers wine tastings during all business hours! They are closed Mondays and Tuesdays but you can check them out Wednesday through Sunday from noon to 6pm. Their next event is tomorrow! It is “Music in the Vineyard”. Enjoy a wine tasting, a little BBQ and music by Richelle Perkins. FUN! Click on this link for more info!